“Let me be as clear as I can be. 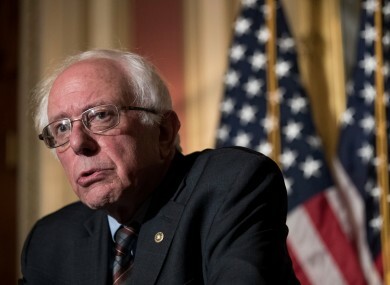 Violence of any kind is unacceptable in our society,” Senator Sanders told Capitol Hill. US SENATOR BERNIE Sanders has condemned a former campaign volunteer who allegedly shot five people today, including House Majority Whip Steve Scalise. In a statement delivered on Capitol Hill, the Vermont senator said that he was “sickened” by the shooting in Alexandria, Virginia, which occurred while Republicans were practicing for the annual congressional baseball game. Let me be as clear as I can be. Violence of any kind is unacceptable in our society and I condemn this action in the strongest possible terms. Real change can only come about through nonviolent action, and anything else runs against our most deeply held American values. The alleged shooter, 66-year-old James T Hodgkinson of Belleville, Illinois, volunteered for Sanders’ campaign in Illinois. He also shared a number of pro-Sanders and content on social media, and was a member of Facebook groups including ‘The Road to Hell is Paved with Republicans’, and ‘Illinois Berners United to Resist Trump’. Email “Bernie Sanders says suspect who shot Republicans volunteered on his campaign”. Feedback on “Bernie Sanders says suspect who shot Republicans volunteered on his campaign”.